Using basketball to strengthen the parent-child bond. To a casual observer, it would seem that the 208 fathers, mentors and children at the Armory on the Hudson on a recent October weekend were simply partaking in basketball drills and learning about a game they love from a former NBA All-Star. But the real lesson of the day involved life and family. 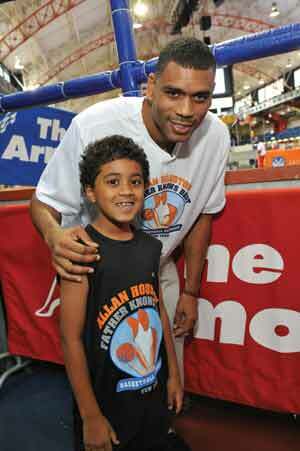 That’s what is important to Allan Houston, the New York Knicks assistant general manager who brings his Father Knows Best program to all parts of the city this year via the iStar Charity Shootout 5-Borough Basketball Tour. Combining an understanding of basketball with tools for building strong parental and mentoring relationships, Houston’s father, coach Wade Houston, spoke about effective fathering. Also supporting the initiative, Paul Bryant, president of the Leadership Institute for Urban Education, led a relationship development workshop. By the day’s end, a special award was presented to participants who exhibited the strongest spirit of togetherness. Later that afternoon, the iStar Charity Shootout welcomed the public, at which point Houston was joined by Jay Sugarman, event founder and chairman and CEO of iStar Financial, Bruce Beck of WNBC-TV and the Harlem Wizards. On-court games and competitions ensued. More than 1,200 people were in attendance for the excitement, which included entertainment by the Knicks City Dancers, the Harlem Wizards, beatboxer Kid Lucky, KISS 98.7 FM, DJ Wade O, the Extreme Team Acrobats and the Elite Marching Band. Food, beverages and apparel were provided by YUM Brands, Powerade, Pop Chips and Champion. ESPN’s Chris Broussard and Kelli Tennant got in on the action as the crowd watched the donations from the Jay & Kelly Sugarman Foundation add up. The foundation donated funds based on how many successful shots were made during the event. In addition, corporate participants were given the opportunity to take a charity super shot from half-court. To spur fundraising for this unique event series, the Jay & Kelly Sugarman Foundation, Katten Muchin Rosenman LLP and Argent Ventures, LLC, contributed $100,000 each toward the goal of $350,000 to help underwrite the Shootout and Father Knows Best program in all five boroughs. A giving challenge has been presented to sponsor individual boroughs at $50,000 each. In total, the launch event raised more than $475,000 for the Allan Houston Legacy Foundation’s Father Knows Best program and the tour. “Since both organizations are committed to improving the lives of New Yorkers, we saw this as an opportunity for a strategic alliance to support the growth and development of young adults, as well families,” Jay Sugarman adds. The 5-Borough Tour is traveling to all five boroughs with the purpose of strengthening family relationships, educating youth, promoting human rights and fighting poverty. Open to the public, the tour welcomes New Yorkers of all ages to change the game, get on the court and strengthen family ties.